Cancer Stem Cells covers a wide range of topics in cancer stem cell biology, including the functional characteristics of cancer stem cells and how they're generated, where they are localized, the means by which cancer stem cells can be targeted, and how cancer stem cells can be reprogrammed back to normal tissue stem cells. Each chapter begins with a brief historical note and concept summary, followed by a description of the latest basic or clinical advance associated with the topic. Dr. V.K. Rajasekhar, M.Sc., M.Phil., Ph.D., is a Senior Research Scientist at Memorial Sloan-Kettering Cancer Center, New York. His work with patient derived prostate cancer stem cell xenografts, a first study in renewable Biobanking of these clinically relevant cells, has garnered eclectic post-publication reviews. Dr. Rajasekhar has received competitive research awards from the Alexander von Humboldt Foundation, Germany, and the Robert A. Welch Foundation, Texas. He has conducted research at MD Anderson Cancer Center in Houston, University of California at Irvine, University of Freiburg in Germany, etc., and taught at the University of California, Irvine and the University of Medicine and Dentistry of New Jersey. Dr. Rajasekhar has served as a peer reviewer for several journals, including Stem Cells, Proceedings of National Academy of Sciences USA, Journal of Molecular Biology, Journal of Cell Biology, Neoplasia, etc. Color plate located between pages 222 and 223. During the last decade, the conceptual themes of stem cell biology have been re-applied, with a new vigor, to the field of oncology. The idea that, similar to normal tissues, tumors can be viewed as “complex societies”, where different cell types are generated as the result of multi-lineage differentiation processes, and organize themselves in hierarchical structures, has now entered the realm of solid tumor biology, and altered the way we think of cancer as a disease. Most importantly, the possibility that tumor tissues, similar to normal ones, might be sustained in their long-term growth by a subset of cancer cells endowed with stem cell properties (i.e. a mutated “cancer stem cell” population capable of both aberrant self-renewal as well as differentiation) has important implications for the future development of targeted therapies. 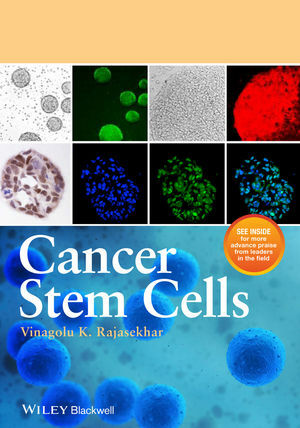 In this beautiful book, Dr. Vinagolu K. Rajasekhar (Memorial Sloan Kettering Cancer Center - New York) thoughtfully weaved together the perspectives and contributions from several of the leading scientists in the field. This book is both an elegant review and a practical guide to the exciting, and still largely uncharted, world of “cancer stem cells”. I praise the editor and the authors for this wonderful endeavor, rich of provocative ideas and challenging concepts, not only for a better understanding of basic cancer biology, but also for the future development of new, more effective, anti-tumor treatments. —Michael F. Clarke, MD., Stanford University, Stanford, CA. USA. —Hans Clevers, MD., PhD., Hubrecht Institute, Utrecht. The Netherlands. —Connie J. Eaves, PhD., FRSC., Terry Fox Laboratory, Vancouver, Canada. "Cancer stem cells have moved onto center stage for those who are interested in the behavior of solid tumors. In the context of carcinomas, these cells hold the prospect of explaining many aspects of the malignant behavior of high-grade tumor cells, including their metastatic dissemination and their responsiveness to a variety of therapies. Those who are interested in developing novel therapeutic strategies for treating solid tumors can no longer afford to ignore these important subpopulations of cancer cells, which increasingly appear to be critical determinants of the success or failure of existing treatments. This volume reports on many aspects of these cells in a variety of human tumors, justifying the notion that CSCs are likely to be important players in virtually all types of human tumors." —Robert A. Weinberg, PhD., Whitehead Institute, Massachusetts Institute of Technology, Cambridge, MA. USA.